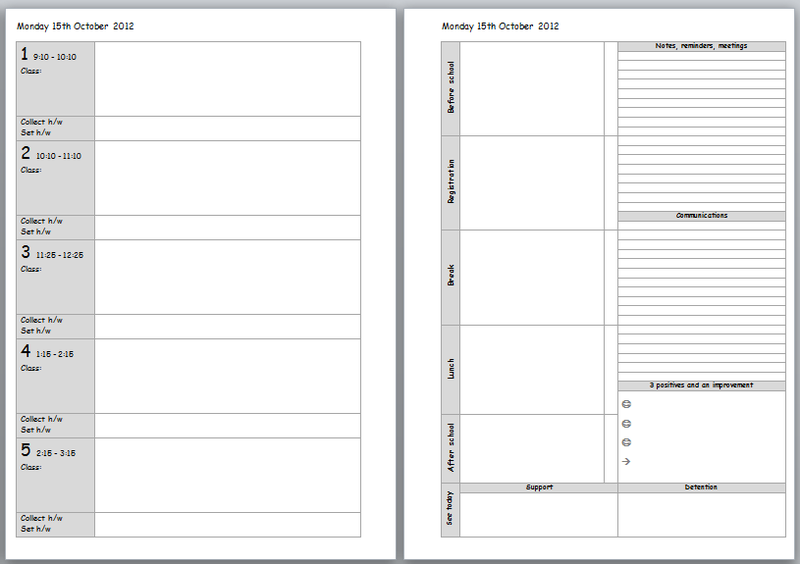 As you may have seen from my last post, I designed a layout that I wanted my Teachers Planner to look like. I have now made the files and with the help of Ray over at My Life All In One Place, they have now been merged and the dates added. I have already merged a copy that can easily just be printed out, either on to A4 or A5 paper depending on your choice, if you need to change the lesson times then you can go right ahead and change them to suit your school/needs. I am going to do a version that has a line to write in your own times but will add that later as I need to go and edit the files but I can’t do that today. So in case anyone wanted to test them out next week onwards I have merged a complete set that covers Monday 15th October until Sunday 23rd December 2012, it currently has the half term week as a regular school week as the holidays change across the UK depending on the area so I have left it as it is currently but I plan to use the Enhanced Time Management week on two pages for my holiday pages so you could print out those for yourself if you wished as well – or you may like to turn the day pages into one big box for the week and have each day on 2 pages, which ever suits your needs. 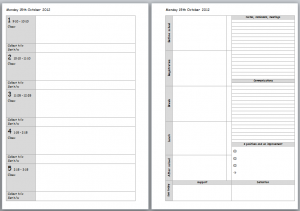 I may also include my customised version with the Enhanced Time Management pages for half terms on here once I have also had a play and created them for myself. You may notice that the font is different in the two Word documents, this is because I prefer the Comic Sans font as being Dyslexic it is clearer for me to read but others may prefer a different font – you can change it as you need yourself! I may also change my font colour to blue before I print mine as well as I much prefer it not being black. I will also print it straight to coloured A5 paper double-sided using my awesome printer! But you could easily booklet print it then chop it in half if you wish/need to print it to A4. 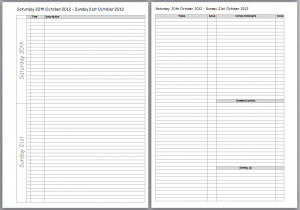 Have a look and let me know what you think, for those of you with less or more lessons a day, you should be able to easily change the left hand page to suit your day as it is only the top rows of each page that have mail merge data on them. Just be careful where your page ends and check you haven’t gone onto a new page by pressing the Enter/Return button on the keyboard as I ran into several problems with carriage returns/page breaks when I merged the original files. It would be good to know what others think of the pages. My thanks again to Ray for helping me with this little project! If you want to change the dates, say for January 2013 onwards then you will need to go into the Excel file. If you change the top date then using the handle at the bottom right corner of the cell (the mouse turns to a smaller black plus symbol instead of the large white plus symbol when you hover over it) click on the black square under the mouse icon and drag your mouse (still holding the mouse button down) down the page until you have changed all the dates to the ones you want. If there are any dates remaining that you don’t need (there maybe as January to July terms are usually shorter) then just delete the entire rows they are on. If you want more dates than I have already put in the spreadsheet, you may also need to use this method to pull down the rest of the other columns as you will need them all for the merge to work properly. Any issues/feedback please get in contact! I found your resource excellent and know it will be of great use next year. However, I am experiencing some difficulty in changing the .doc template to 9 lessons per day. I make the relevant adjustments and it keeps reverting back to the original form once I click “Finish & Merge”. I would really appreciate if you could advise how to overcome this issue asap. 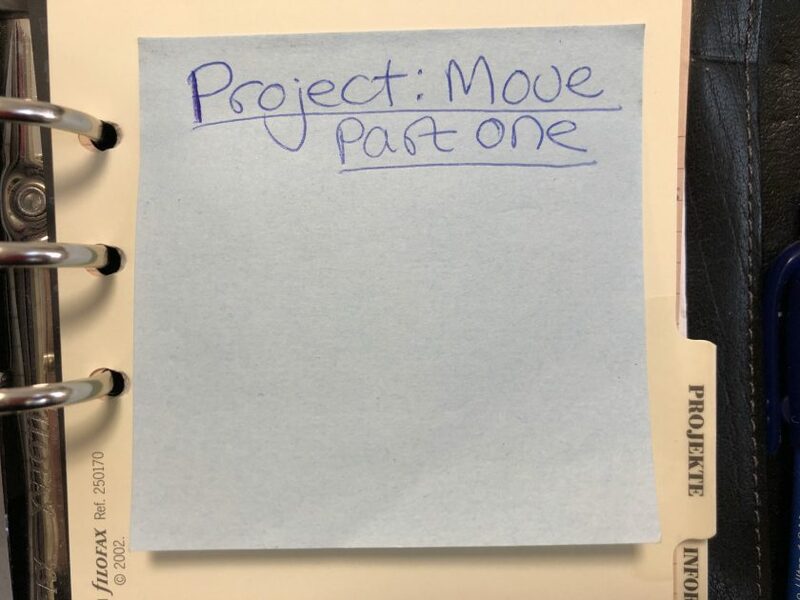 Hi Sarah, have you just opened the Word document and then tried to edit it or have you pressed the buttons in order to get into the actual layout and code bit? If you haven’t seen any mail merge code then I suspect this is why the document doesn’t merge and show your changes. Where do you want the extra lesson boxes? 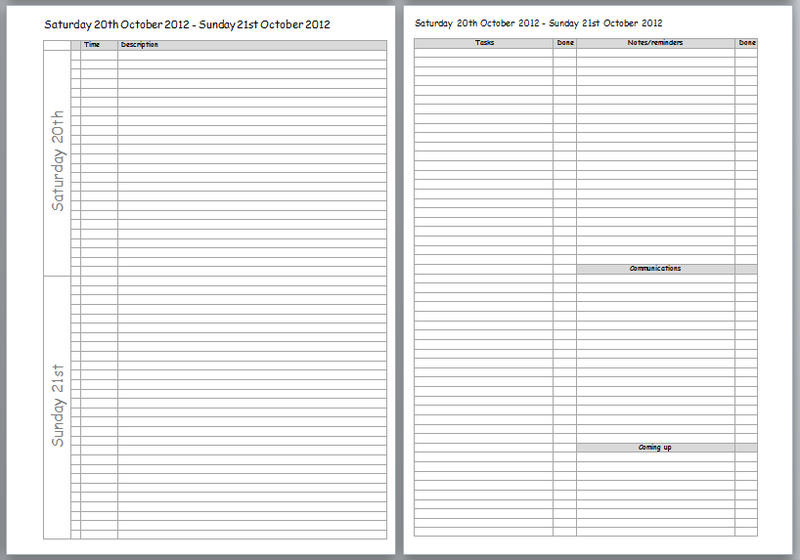 Are you wanting them on the left page or changing the right hand page to accommodate them? Many thanks for your reply. 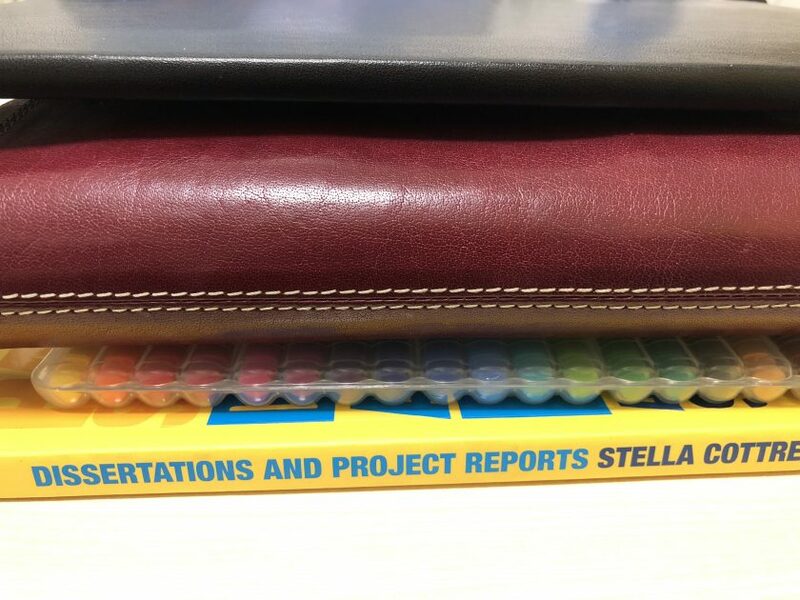 I have figured it out and am delighted with my new planner. Many thanks for sharing this. I have just entered the world of filofaxing and get annoyed with the commercial teaching planners as they are never quite right for what you want them for! Yours is perfect. Thanks Katrine! I am very glad you like it! Hi, it doesn’t seem to be working for me. Is the link still live please? Would find this very useful indeed! Many thanks, Nicola. It is still live – what happens when you click the link? Hi, I’ve managed to access the links now (turns out it was an issue with my computer at school) but I’ve not been able to make changes to the word document (adding a sixth lesson and changing the times) that are then in effect in the mail-merged document. Any tips gratefully received! I’ll try to look for an instruction guide or youtube video but I’m not quite sure what to search for. Sorry, very new to this! Hi again, I’ve been persevering but without any luck! Came buck to read your instructions more carefully and saw that I’m having the same problem as Saz did. It sounds like your advice to ‘get into the actual layout and code bit’ is exactly what I need to do too but I don’t know how to do this? Is there a button I need to be looking for please? I am having the same issue. Please help.